Color: Blue -Description: Blue cotton jacket, with collar with ivory and red pettersham trimming, closure with buttons and flapped pockets, on the front. 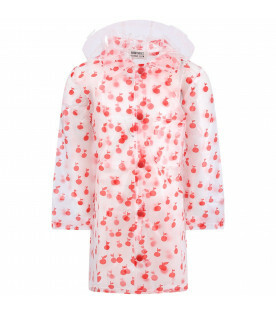 It is embellished with white iconic GG all-over and red and white details. -Details: 100% Cotton. Dry clean only. 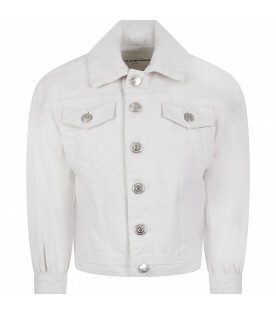 Color: White -Description: White denim jacket with long sleeves, collar, closure with branded metallic logo, on the front and on the cuffs and flapped pockets with button. 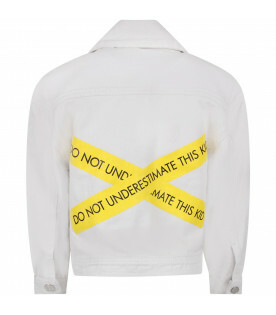 It is embellished with yellow rubbred stripes with black writing, on the back. -Details: 100% Cotton. Machine wash at 30°C. 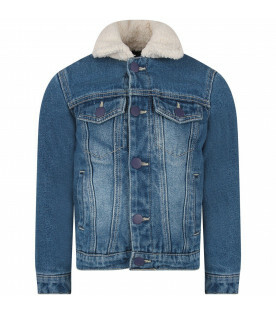 Color: Blue -Description: Blue denim quilted jacket, with ivory shearling classic collar, closure with press-studs, flapped pockets with press-studs and side pockets, on the front. - Details: 100% Cotton. Machine wash at 30°C. Color: Beige -Description: Beige bomber jacket, made from satin, with ribbed old school collar, long sleeves, side pockets with press-studs and closure with zip, on the front. 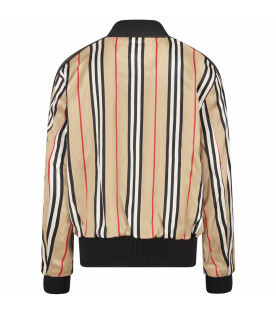 It is embellished with white, red and black all-over stripes. -Details: 100% Viscose. Dry clean only. Color: Black -Description: Black cape with hood, zipped side pockets and closure with zip, on the front. It is embellished with white rrubbred logo. -Details: 50% Polyamide 50% Polyester. Machine wash at 30°C. Color: Beige -Description: Beige trench coat with frontal closure with buttons and flap, side pockets and signature button-tab cuffs; it is lined with vintage checked pattern and central rip on the back. It is embellished with black logo and writing. -Details: 100% Cotton. Dry clean only. 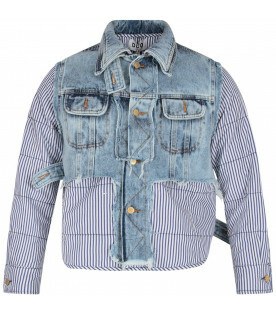 Color: Denim -Description: Patchwork denim jacket with double classic collar, two pockets with frontal flap with button and closure with buttons on the front. -Details: 100% Cotton. Dry clean only. Description: Blue and black checked shirt with classic collar and long sleeves; two pockets and clips closure on the front and on the cuffs. 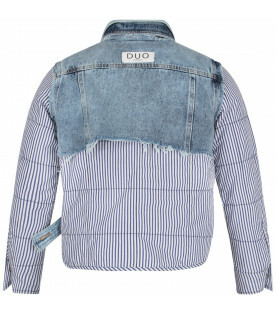 It is embellished with white, green and blue checked pattern sleeves and white rubberd logo, on the back. -Details: 100% Cotton. Dry clean only. Color: Blue -Description: Blue cotton jacket, with collar with black pettersham trimming, closure with buttons, frontal pockets and rip on the back. 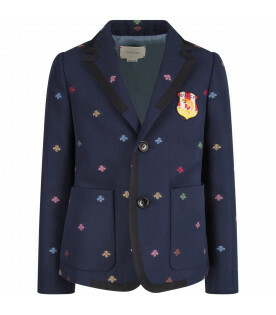 It is embellished with colorful embroidered iconic bees all-over and patch with blue logo, on the front. -Details: 100% Cotton. Dry clean only. Color: Black -Description: Black windbreaker, with hood, side pockets with zip and clsoure with zip, on the front. 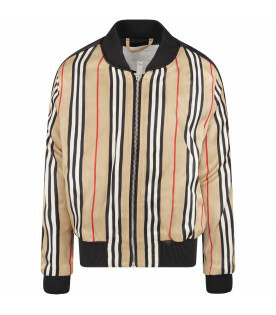 It is embellished with side ornage stripes, black rubbred iconic logo, on the sleeve and white embriodered logo, inside the hood. -Details: 100% Polyamide. Machine wash at 30°C. Color: Light blue -Description: Light blue windbreaker, with collar, hood, long sleeves, side pockets with white zip, and closure with zip, on the front. It is embellished with yellow iconic patch with embriodered logo, on the sleeve. -Details: 100% Polyamide. Machine wash at 30°C. Color: Light blue and white -Description: Light blue and white striped windbreaker jacket, with hood, closure with zip, and pockets with zip closure, on the front. 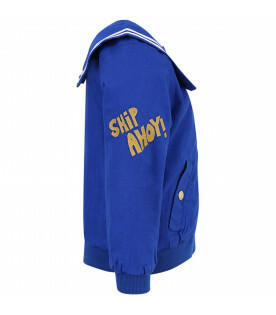 It is embellished with colorful patch with iconic compass and logo appliqued on the sleeve. - Details: 100% Polyamide. Machine wash at 30°C. Color: Blue -Description: Blue windbreaker jacket with hood, double closure with zip and press-studs, side pockets and elastic cuffs. It is embellished with metallic iconic logo, on he hood. -Details: 100% Polyester. Hand wash.
Color: Azure -Description: Azure jacket with grey lining inside and hood. 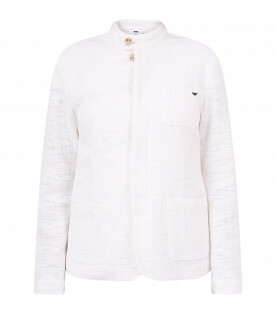 Soft, natural down feather padding and zip closure on th front. Side pockets zip and elasticated cuffs. Iconic rubbered logo on the sleeve. -Details: 100% Polyester, padding 90% Duck down 10% Duck feathers. 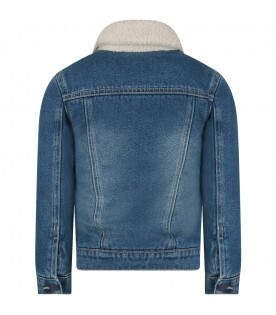 Wash at 30° C.
Color: Light blue -Description: Light blue denim jacket, with long sleeves and classic collar; buttons closure, on the front and on the cuffs; flap pockets with button on the breast and side inseam pockets. It is embellished with colorful seamonster, on the back and beige embrodiered logo, on the front. - Details: 98% Cotton 2% Elastan. Machine wash at 40°C. Color: Black -Description: Black windbreaker with hood, side pockets and closure with zip, on the front. It is embellished with colorful all-over logo. -Details: 100% Polyamide. 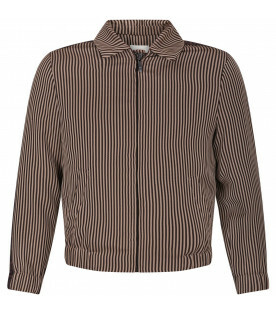 Hand wash.
Color: Beige and brown -Description: Beige and brown striped bomber jacket with collar, long sleeves, side pockets and closure with zip, on the front. It is embellished with brow double FF, on the sleeves. -Details: 75% Viscose 25% Polyester. 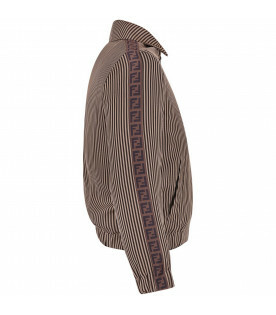 Hand wash.
Color: Light brown -Description: Light brown jacket, with two pockets, breast pocket, and closure with two press-studs, on the front and rip, on the back. 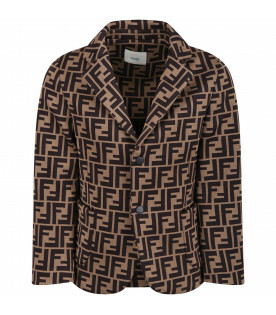 It is embellished with brown all-over double FF. -Details: 60% Cotton 40% Polyester. Machine wash at 30°C. 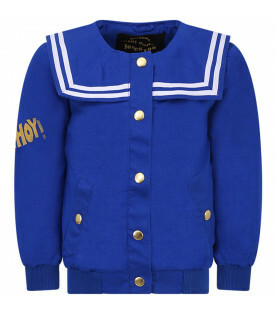 Color: Blue -Description: Blue bomber jacket with collar, elasticized cuffs and hemline; closure with zip and side pockets with botton, on the front; it is embellished with white iconic logo on the front. -Details: 83% Polyester 17% Polyamide (Shell) 100% Polyamide (Lining). Dry clean only. 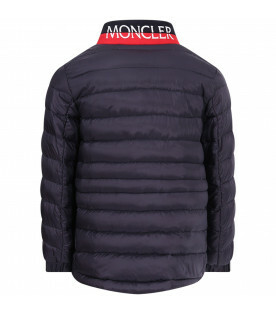 Color: Black -Description: Black quilted jacket with hood, closure with zip and side pockets with invisible zip; orange iconic rubbered logo appliqued on the sleeve; it is padded with Plumtech, synthetic heat wadding, made respecting environment and animals; it is breathability, heat-retaining and pockatable, in fact it comes in a comfortable bag, where put it for carring. -Details: 100% Nylon (Main fabric). 100% Polyester (Filling). Machine wash at 40°C. 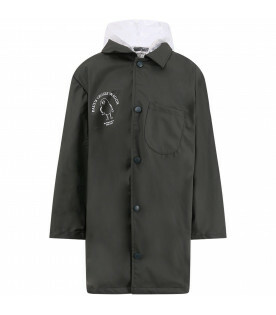 Color: Military green -Description: Military green windbreaker parka with hood, closure with zip, on the front, side pockets with zip and grey inside; orange iconic rubbered logo appliqued on the sleeve; it is breathability, heat-retaining and pockatable, in fact it comes in a comfortable bag, where put it for carring. -Details: 100% Nylon (Main fabric). 100% Polyester (Filling). Machine wash at 40°C. Color: Black -Description: Black windbreaker parka with hood, closure with zip, on the front, side pockets with zip and grey inside; orange iconic rubbered logo appliqued on the sleeve; it is breathability, heat-retaining and pockatable, in fact it comes in a comfortable bag, where put it for carring. -Details: 100% Nylon (Main fabric). 100% Polyester (Filling). Machine wash at 40°C. Color: Azure -Description: Azure quilted jacket with hood, closure with zip and side pockets with invisible zip; light blue iconic rubbered logo appliqued on the sleeve that it symbolizes the financially support the 'Ocean Initiatives' ; it is padded with Plumtech, synthetic heat wadding, made respecting environment and animals; it is breathability, heat-retaining and pockatable, in fact it comes in a comfortable bag, where put it for carring. - Details: 100% Recycled nylon (Main fabric). 100% Polyester (Filling). Machine wash at 40°C. 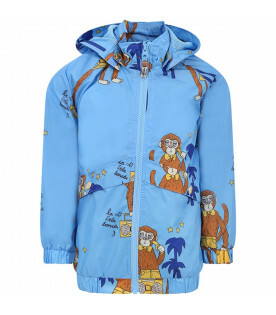 Color: Royal blue -Description: Royal blue windbreaker jacket with hood, closure with zip, on the front, side pockets with zip and light blue inside; orange iconic rubbered logo appliqued on the sleeve; it is breathability, heat-retaining and pockatable, in fact it comes in a comfortable bag, where put it for carring. -Details: 100% Nylon (Main fabric). 100% Polyester (Filling). Machine wash at 40°C. Color: Blue -Description: Blue quilted jacket with hood, closure with zip and side pockets with invisible zip; orange iconic rubbered logo appliqued on the sleeve; it is padded with Plumtech, synthetic heat wadding, made respecting environment and animals; it is breathability, heat-retaining and pockatable, in fact it comes in a comfortable bag, where put it for carring. -Details: 100% Nylon (Main fabric). 100% Polyester (Filling). Machine wash at 40°C. Color: Blue navy -Description: Blue navy reversible padded jacket, with hood, closure with zip, side pockets with invisible zip and orange iconic rubbered logo appliqued on the sleeves; grey quilted inside, with side pockets with invisible zip and orange iconic rubbered logo appliqued on the back; it is padded with Plumtech, synthetic heat wadding, made respecting environment and animals; it is breathability, heat-retaining and pockatable, in fact it comes in a comfortable bag, where put it for carring. -Details: 100% Nylon (Main fabric). 100% Polyester (Filling). Machine wash at 40°C. Color: Red -Description: Red windbreaker jacket with hood, closure with zip, on the front and side pockets with zip; orange iconic rubbered logo appliqued on the sleeve; it is breathability, heat-retaining and pockatable, in fact it comes in a comfortable bag, where put it for carring. -Details: 100% Nylon (Main fabric). 100% Polyester (Filling). Machine wash at 40°C. 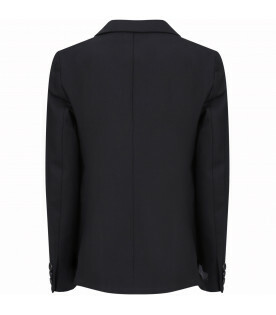 Color: Black -Description: Black jacket, with shawl collar, closure with buttons, frontal pockets with flap and rips on the back. It is embellished with white details. -Details: 53% Polyester 43% Wooll 3% Polyamide. Machine wash at 30°C. Color: Blue,light blue and white -Description: Blue,light blue and white jacket made from cotton with closure with two bottons on the front and flapped side pockets; it is embellished with iconic metallic D appliqued on the back. -Details: 76% Cotton 24% Linen. Machine wash at 30°C. Color: Blue,light blue and white -Description: Blue and white jacket, made from roped cotton with closure with two bottons on the front and side pockets; it is embellished with iconic metallic D appliqued on the back. -Details: 86% Cotton 14% Polyester. Hand wash.
Color: Blue -Description: Blue jacket made from cotton, with side patch pockets, breast pocket, back rip and closure with two bottons; it is embellished with iconic metallic D appliqued on the back. - Details: 97% Cotton 3% Elastan. Machine wash at 30°C. 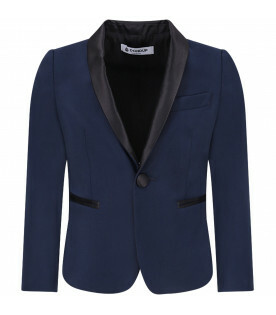 Color: Blue and black -Description: Complete composed of blue jacket with side inseam pockets,breast pocket, closure with two buttons and rip on the back. Collar,pockets and buttons are in black satin. 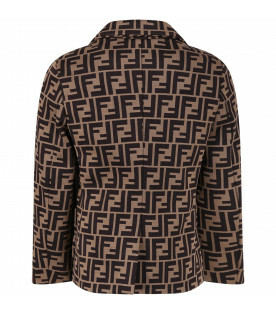 Iconic metallic D appliqued on the back. 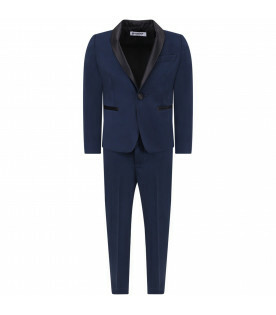 The pants is blue with black satin side stripe. It has a straight, regular fit with a frontal crease, side pockets and side inseam back pockets. Closure with clip and zip and adjustable waistband thanks to inside elastic with buttons. 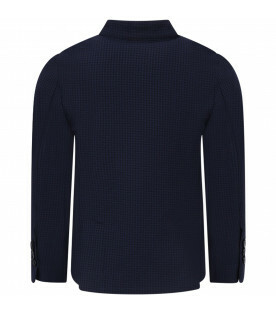 -Details: 100% Virgin wool. Dry clean only. 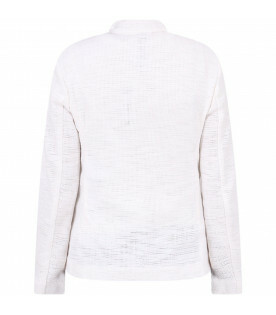 Color: White -Description: White jacket with mandari collar, long sleeves, three pockets, on the front, rips, on the back and closure with bottons and flap, on the front. It is embellishd with metallic iconic eagle, on the front. -Details: 100% Cotton. Dry clean only. Color: Blue -Description: Blue honeycomb jacket with mandari collar, long sleeves, three pockets, on the front, rips, on the back and closure with bottons, on the front. It is embellishd with metallic iconic eagle, on the front. -Details: 100% Polyester. Dry clean only. Color: Blue -Description: Blue denim jacket, with classic collar, closure with metallic button on the front and breast pocket with buttons. It is embellished with white all-over logo. - Details: 100% Cotton. Hand wash.
Color: Blue - Description: Blue quilted jacket, with closure with zip, side buttoned pockets and collar in red and blue with logo in a contrasting white; foldable hood, hidden inside the collar; iconic logo appliqued on the sleeve. - Details: 100% Polyamide (Main fabric). 90% Down 10% Feather (Filling). Hand wash.
Color: Multicolor -Description: Colorful camouflage jacket with classic collar, four front pockets and closure with buttons, on the front; made from organic cotton. 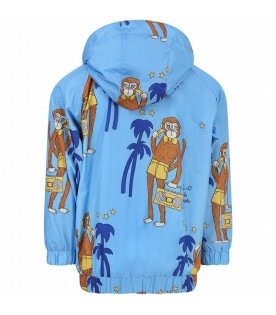 It is embellished with red embroidered logo and colorful patch shaped like monkey, on the front. -Details: 100% Oragnic cotton. Machine wash at 40°C. Colore: Celeste -Descrizione: Giacca a vento celeste con cappuccio rimovibile, maniche lunghe, tasche con clip e chiusura con zip, sulla parte anteriore. E' decorato con scimmie marroni e palme blu all-over. E' realizzato in poliestere riciclato, prodotto in modo sostenibile. - Dettagli: 100% Poliestere. Lavare a 40°C. 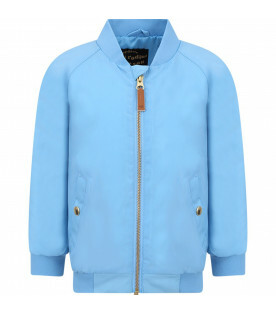 Color: Light blue -Description: Light blue bomeber jacket with old school collar, front pockets wwith press-studs and closure with zip, on the front. 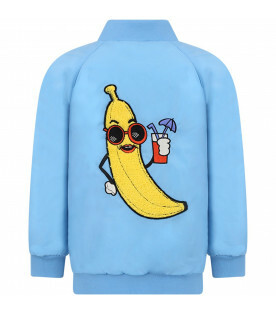 It is embellished with yellow patch shaped like banana and sunglasses, on the back. It is made from recycled polyester, produced in a sustanaible way. -Details: 100% Polyester. Machine wash at 40°C. 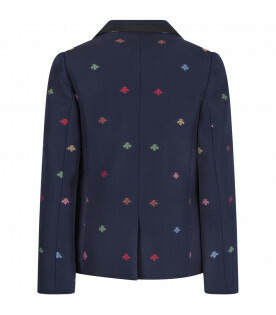 Color: Blue -Description: Blue jacket with sailor collar, press-studs pockets and closure tih press-studs, on the front. 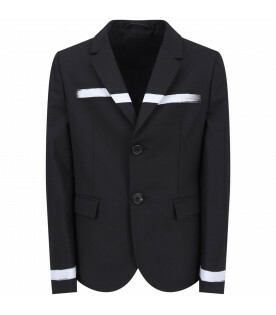 It is embellished with gold embroidered writing, on the sleeve and white details. -Details: 100% Organic cotton. Machine wash at 40°C. 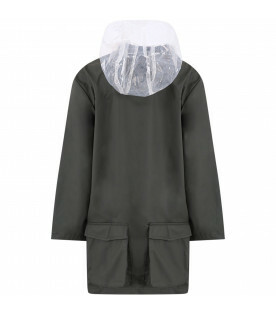 Color: Military green - Description: Military green raincoat, with transparent hood, closure with clip buttons, side pockets and white print on the breast. This garnment belongs to "To Make a Garden" collection, a call for saving honeybees by plating gardend everywhere, everytime. -Details: 100% Poliestere. Machine wash at 30°C. 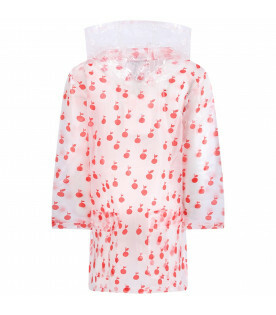 Color: Transparent - Description: Transparent raincoat, with transparent hood, closure with clip buttons, side pockets and red apples all-over print. This garnment belongs to "To Make a Garden" collection, a call for saving honeybees by plating gardend everywhere, everytime. -Details: 100% Poliestere. Machine wash at 30°C.